Learning numbers and shapes are the foundation to a successful start in mathematics. Take advantage of the time when your students are young to instill a love for counting and shapes! You can do that with a little help from these tools and toys. Let’s take a look and see if you can find some new favorites to use. This post contains affiliate links. Use this pie game to introduce kids to numbers, sorting, and even simple addition and subtraction. Students will also get some pincer grasp practice as well. I use these fruit counters for STEM challenges and for play dough trays too! Students can learn the beginning concepts of geometry by making shapes out of rubber bands. Geoboards also help kiddos develop fine motor skills. Practice math with the help of this huge tub of colored dominoes. Students can play games to match the numbers, sort, or they can set them up as they identify the numbers just to knock them down! Create patterns by lining up a variety of shapes. Students can duplicate patterns, or create their own. These are great for creating pictures and for STEM challenges! This set is great to have on hand to teach students how to count by 1’s, 2’s, 3’s, all the way up to 10’s. You can also use these cubes to make patterns or to group colors. 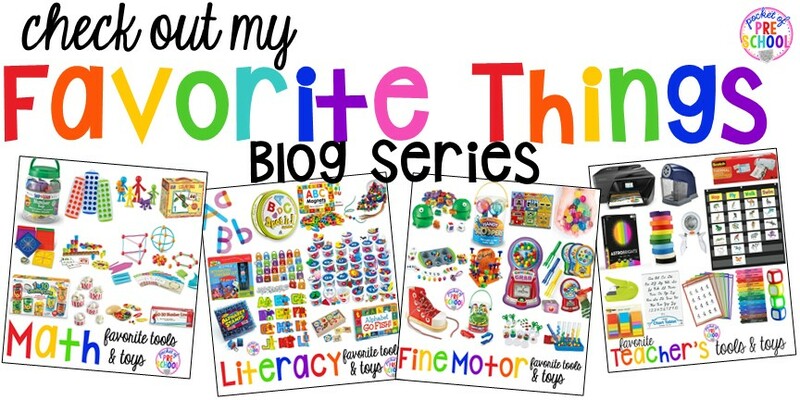 I use them for many of my themed math and literacy center packs too! Students love these squishy, colorful worms. This set comes with an activity guide that is full of great ideas. Kids can learn how to measure, sort, and count. These are fun to put in the blocks center or in the sensory table too! Use owls to count from 1 to 10 as you perch these little hoots on the branch. A fantastic visual! Match, sort, and count by using muffins! This set would be great with the storybook If You Give a Moose a Muffin, for a bakery theme, or pretend they are cupcakes for a birthday theme! Use these trays to count small objects such as pom poms. Students can use them to sort colors, count, or make patterns in the tray. I keep a tub of pompoms with gator tweezers next to the trays too to add a fine motor component too. The colored part is rubber so they can poke out the pom poms! These are one of my students’ FAVORITE things in my discovery center. They are on my math shelf all year long. Students can build 3-D and 2-D shapes with this geometry set. It includes a set of cards that have visual directions which are very easy for young kiddos to follow. Introduce your students to a number line they will never forget. It is the perfect way to get kids to learn on their feet and moving to learn various math concepts! 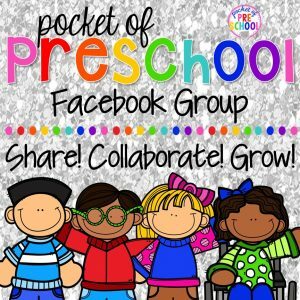 This is fun to use during circle time too! It’s time to pull out the Play-Doh and start sculpting some numbers! Playing with Play-Doh never gets old. These are fun too to use as stamps with paint. Just dip the number cookie cutter in paint then stamp it on the paper. I have shown you these before, only they were the Alpha Bots. If you have that set, then you definitely need to pick up the number version. My students LOVE these! This is one huge floor puzzle! It measures 10 feet long! After students have finished putting the puzzle together, they can measure it with this Kid’s Tape Measure. Match the numbers to unlock the padlocks. Each padlock has both stars and the number written out to help students identify both. These are great to build fine motor too! Use these family member figures to help students count. This set includes figures of mom, dad, brother, sister, baby, and even pets. These are my all time FAVORITE counters! You can use them for so many themes like family, community, and all about me. We use them for STEM challenges too! My other favorite counters are: Pets, Transportation, Bugs, and Veggie. Snap together the matching amount with the numbers to make a bug. Color recognition and fine motor skills are also put to the test with this math tool. Stacking blocks are fun… but it gets even better with this set of blocks that are in the shape of numbers! You can even make addition and subtraction equations to test your student’s knowledge if you teach kinder. These blocks are also stamps and super fun to use with Kinetic Sand, paint, or play-doh too! These canned goods each have a number with a corresponding amount of pieces of fruit and veggies inside.The perfect addition to a play kitchen or when you have a grocery store. Pair this with a short movie, and maybe some real popcorn as a snack, and I guarantee you, the whole class will be inspired to count. The fun thing about these favorite math tools and toys is that you can use them throughout your classroom. Adding a little bit of math, numbers, and shapes throughout everyday items that students come into contact with allow them to learn even more! 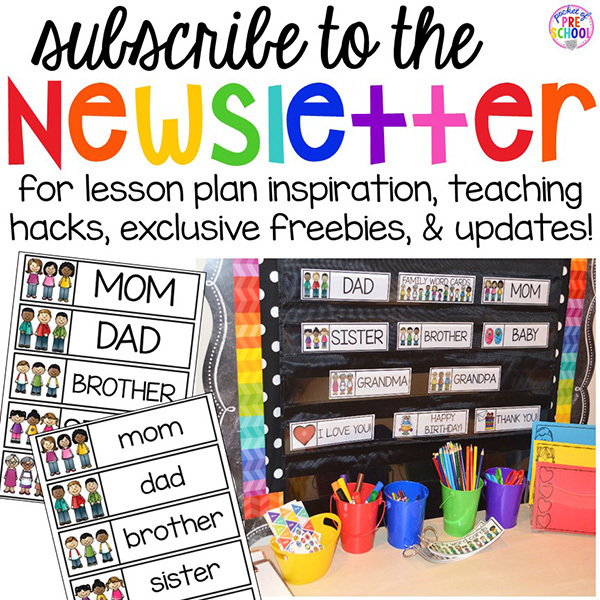 Want even more ideas for your math center? Check out this post and grab a few path game FREEBIES too. Click HERE or the photo above! Watch the FB LIVE video below to see my discovery center in my preschool classroom. I combine my science and math together to make one center! I talk about the science stuff first so you can skip ahead to 33 minutes where I show you the math shelf! LOVE these math tools? Pin this image!